If there's anything that hasn't changed all that much over the years, it's graveyards. Dig a hole six feet deep, throw in the casket, erect a monument, and you're done. Given how emotional and intense this topic is, it's easy to understand the reluctance for fancy innovations. But owing to a number of pressures including dwindling land space and environmental concerns, cemeteries are increasingly finding they have no choice but to adapt. 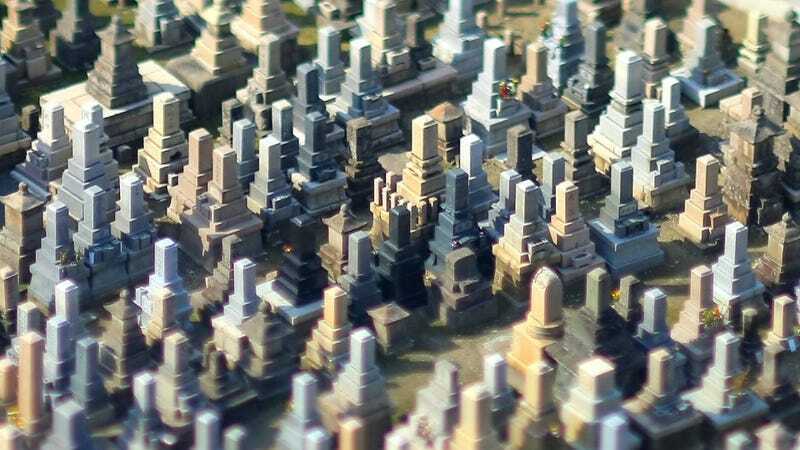 Here's how graveyards of the 21st Century are starting to change into something that barely resembles their previous incarnations. The Green Movement has caused a big rethink when it comes to lots of things, cemeteries not excluded. To that end, the enviro-conscious have started a new trend called "natural burials". The basic idea is that bodies should be returned to the earth in a more traditional and dignified way. Part of this sentiment is being driven by the perception that death has become sanitized, commercialized, and prohibitively expensive. Natural burials are an effort to rediscover and reconnect with our ancient death rituals — and it's an idea that's quickly taking off. It's also turning out that cremations may not be as environmentally friendly as previously thought. Studies have found that cremations, which account for as much as 76% of all funerals in some districts, release pollutants such as mercury and carbon dioxide into the atmosphere, in addition to consuming significant amounts of energy. In a natural burial, or what the Brits call a "woodland burial", bodies are buried without chemical embalming. All caskets must be biodegradable, made from either untreated wood or cardboard. Alternatively, bodies can be buried in cloth shrouds. The plots themselves are not lined with plastic or concrete like they are in most North American cemeteries. Graves are dug shallow enough to allow microbial activity similar to that found in composting. And in "green cemeteries", visitors won't see any tombstones or freshly manicured lawns. In place of headstones, some green cemeteries are instead burying bodies equipped with a global positioning device. To help find the location of their deceased loves ones, family and friends visiting the cemetery are given hand-held GPS units. And as part of the overall eco-friendly aspect, green cemeteries are left to grow and develop in natural ways. Visitors to the cemetery can expect to see the environment in its natural state, free from noisy and smelly groundskeeping machinery. Green cemeteries employ a wide variety of land management techniques to maintain the burial area in perpetuity, including sustainable agriculture, restoration ecology, habitat conservation projects, and permaculture. For those who can't (or won't) make the trip out to a graveyard, Arlington National Cemetery is working on a solution. The US Army says it has begun implementing an ambitious digital, geospatial technology project that will make Arlington one of the most high-tech cemeteries in the world. They plan on using new geospatial mapping technology to improve operations and provide a better experience for visitors - regardless if they choose to show up in person or visit online. Once complete, people will be able to go on the web and explore individual gravesites. Mourners or the morbidly curious will be able to click and zoom in on a specific grave and learn about who is buried there. The Army is working to create a single, verifiable and authoritative database of all those laid to rest at Arlington. The new system will also offer a smartphone application that will allow families to search the database so they can easily find a headstone or other points of interest in the cemetery. The initiative is also part of a larger effort to digitize operations and replace old paper-based records. It was their poor record keeping that led to a huge scandal for the cemetery when hundreds of mismarked graves and misplaced remains were uncovered. Dwindling land options are becoming an increasing problem for urban graveyards, particularly in Japan. In a country where burial plots can cost as much as $100,000, and where ancestor worship is still highly practiced, some are turning to a more affordable and hi-tech solution: multi-storey graveyards. By converting old warehouse building space into a place to mourn the dead, the Japanese have come up with a rather innovative idea — one that might pave the way for other districts vying for valuable cemetery space. For those visiting the facility, the practice of visiting the cremated remains of their loved ones couldn't be easier. After sliding an access card through a slot, the stored remains of the deceased are brought directly to them by means of a conveyor belt. Mobility and convenience, say the patrons, are key. One facility can contain over 7,000 bodily remains. A normal graveyard would only be able to provide about 100 graves in the same area of land. Demand is so high for these new facilities that Japanese citizens are scrambling to reserve their spots well in advance. A new facility is currently being built, and already one quarter of it is accounted for - even with a price tag of $8800. There's no question that cremations are on the rise. Burials have been on the steady decline owing to economic hard times, growing environmental consciousness, increased social acceptance, and a shift in religious values. Consequently, funeral homes are feeling threatened as a large part of their profits are driven by big funerals. And the numbers back this up. A cremation costs about $2,070 in the U.S. compared to the average cost of a full-service burial which runs around $7,755. In the United States and Canada, businesses have declined from 137,000 in 2005 to 132,000 in 2010, according to the Bureau of Labor Statistics. Skilled embalmers are particularly hard hit where employment in that profession has declined 28% in less than ten years. The writing is on the wall as far as burials go, and funeral homes are trying to find ways to adapt. The key, say industry leaders, is for funeral directors to get families to purchase costly urns, ash accessories, and other services instead of the usual, low cost "direct cremation" featuring a no-frills container for the ashes. This means that funeral homes will have to build inviting showrooms to display urns and accessories, while convincing families to pay for custom memorial services. Funeral homes are also considering rebranding themselves as "regional cremation specialists." The Seattle-based headstone manufacturer Quiring Monuments is certainly looking to take the graveyard experience to the next level. In an effort to tap into the latest technology and better connect with a younger generation of mourners, they have created new burial markers so that visitors can learn more about the deceased and leave messages for them. To do so, visitors will require a smartphone or mobile device and a free app that's provided by the company. As for the headstone itself, Quiring Monuments imprints QR (i.e. "quick read") square barcodes on black plastic and copper stickers that are affixed to the monument. Visitors can scan the code with their smartphone and be redirected to a website set up by the late person's family. Each site is highly personalized, containing messages, comments, recollections, photos, family history, and a map to the grave's exact location. Quiring Monuments, which is looking to capitalize on the social networking craze, introduced the technology in 2011 and has nearly 20 families using the feature. Law enforcement groups have expressed interest in using the technology for large monuments. Eventually, the company wants to include QR codes in every headstone purchase, which costs an additional $65 to $150. And in order to significantly up the creepy factor, Quiring Monuments would also like to add video to the grave-visiting experience. They recently experimented with Vidstone, a solar-powered video screen that can be mounted on a monument and plays a pre-recorded message. The possibilities for spooky pranks from beyond the grave are nearly endless. There's also the possibility that graveyards will be replaced by the digital realm altogether. Social networking sites are tapping into into the potential for virtual monuments to be created online after the death of a user. Both Facebook and Twitter have policies in place to ensure that a deceased user's profile is handled in a sensitive and thoughtful way. Families can ask to have the profile deactivated altogether, or archived and made available to a select group of individuals. Alternately, the profile can be converted into a digital memorial that's open to the general public. If the profiles are frozen and left in an unaltered condition, they would serve as poignant snapshots of a person's life. The complete history of their posts, shared chats, photos, videos, and anything else allowed by the user could be displayed as a virtual shrine. And of course, it could also serve as a place for friends and family to reminisce, mourn, and leave comments. There's another futuristic twist to all this, and that's the possibility that cryonics will increase in popularity, leading to an entirely new category of graveyards: corridors filled with vats containing the temporarily dead. Currently, those frozen in cryonic stasis are placed in patient capsules called dewars. They're designed for long-term safety and cost effectiveness, so they don't have any viewing ports through which the patients can actually be seen (not that that's a bad thing). That said, cryonics facilities like Alcor allow family members to tour the facilities and visit their loved ones at the Alcor Patient Care Bay. As a visitor, though, you'll need to remain politically correct and resist the temptation to describe the patient as "dead" — a definite cryonics no-no. Alcor also accepts cards and letters sent to loved ones on special events, notably birthdays and other holidays. The company keeps these sealed communications in safekeeping for the patient in cryostasis. It is hoped that if and when these intrepid cryonauts are brought back to life that these communications will help them catch up on what happened with their families while they were in suspension. These mementos may also serve as important memory joggers. Body images via Wikipedia, BBC, Bit Rebels, Flow, and Alcor.